Federal agencies in the D.C. area and some school systems were delayed Monday morning after freezing rain left area roads wet and icy. Federal workers in the metro area can arrive two hours late Monday, or use unscheduled leave or telework, the Office of Personnel Management said. School officials in Loudoun County in Virginia and Frederick County in Maryland decided to cancel class for the day after initially deciding on a two-hour delay. In addition, the Maryland State Highway Administration warned that icy conditions could complicate the morning commute, and urged drivers to delay or cancel early morning travel Monday. In the District, more than 200 plows were out early Monday to treat the roads. The city is asking property owners to also put rock salt or de-icer on the sidewalks to prevent ice from forming. So far, Metro says it's sticking to a normal weekday schedule for bus and rail service. Loudoun County and the city of Falls Church, Virginia say they will be open for business -- but employees can use unscheduled leave if they need to. 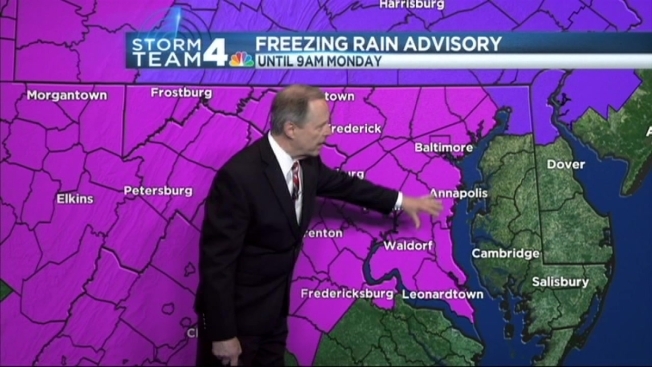 The delays stem from a freezing rain advisory in effect from 10 p.m. Sunday to 9 a.m. Monday for Anne Arundel, Calvert, Charles, Culpeper, Fauquier, Frederick, Howard, Loudoun, Montgomery, Prince George's, Prince William, Rappahannock, Spotsylvania and St. Mary's counties as well as the City of Fairfax. Rain is likely throughout the area, and depending on how cold it gets, it could freeze on contact. Because of the recent cold weather, surfaces could become icy even if the air temperature remains above freezing. There is only a moderate risk for freezing rain in D.C. It’s more likely in northern Maryland, the West Virginia panhandle and the Shenandoah Valley. When the rain gets steadier and heavier about 8 a.m. or 9 a.m., it will allow the temperature to rise into the mid-30s, ending the freezing rain. But the intensity of the rain will increase and could continue through Monday evening before coming to an end Tuesday morning. Road crews will pre-treat highways, but the morning commute could be slick.